MSG 2 is a bizarre experience, says Raja Sen.
Who are the truly civilised? 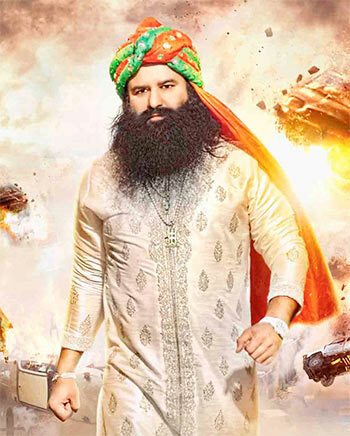 Bear with me, for I agree no review of MSG 2 Messenger Of God -- coming to us from auteur godman Gurmeet Ram Rahim Singh Ji Insan -- should begin with any remotely deep conversation, but this production is an unlikely beast, a laughable product that nevertheless forces us to introspect a bit and ask ourselves who we are. The first MSG was an outlandish work of gargantuan buffoonery wherein Mr Insan single-handedly waged war on drugs. In this sequel, he goes deep into weird jungles and tries, in his own smiling and uniquely violent way, to rehabilitate the savages. Still, this is a genuinely staggering bit of flamboyance, with Mr Insan -- taking on the role of actor, director, cinematographer, composer, choreographer, rap artist and (naturally) costumier -- drowning with an absolute lack of self-awareness in a self-made sea of cinematic sewage. It's enough self-aggrandisement to make Salman Khan and Arnab Goswami appear subtly self-effacing, and just scaling those heights of ego is... Well, something else.